The first cloud-based telephony architecture to enable truly geo-distributed and resilient voice, video and multi-media services. It allows two or more ActivePBX® hosts located in geographically dispersed data-centers to act as a single unit enabling redundancy and fail-over. The solution is based on a robust inter module messaging system that allows service delivery components to reliably subscribe to and receive events over inherently unpredictable networks such as the public Internet. 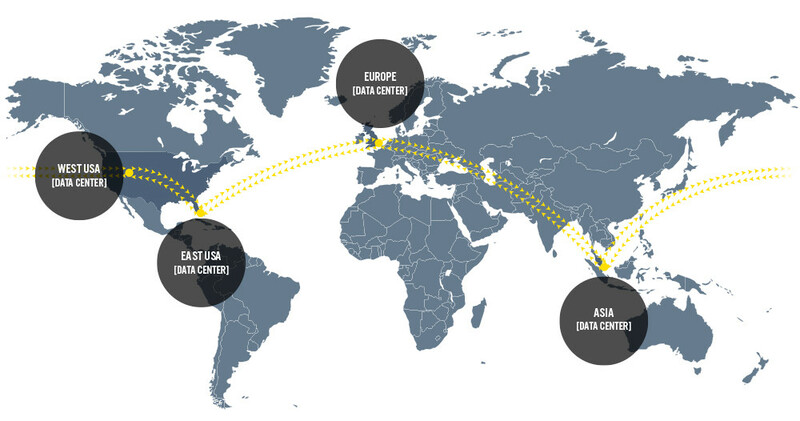 Most high-availability or n+1 redundancy schemes rely on a primary and failover node. In contrast, the DualPBX® platform is Always Active – meaning that you can provide identical service across multiple locations in real-time. And, with seamless and transparent failover between nodes, service disruptions can be avoided as customer connections are automatically transferred to any remaining nodes available. This means that a voicemail can be left on one feature server, and retrieved on another server immediately, even if the first server is no longer available. It also means that feature options (such as callforwarding or other * codes) take effect across all hosts immediately, regardless of the distance between any of our 4 data centers. An additional benefit of the DualPBX® architecture is that load can be dynamically shared across all connected nodes based on geographic distance from the user. Especially in cases where media-anchoring is required, this optimizes quality of service by ensuring voice and video payload will take the shortest path between the sender and receiver. Mobile workers are now adopting SIP clients running over 3G and 4G wireless networks, where network conditions are often unpredictable. As a result, the ability to maximize quality of service in a scalable and reliable way is becoming more important than ever. As call volume increases, capacity can be added by deploying additional ActivePBX® hosts. 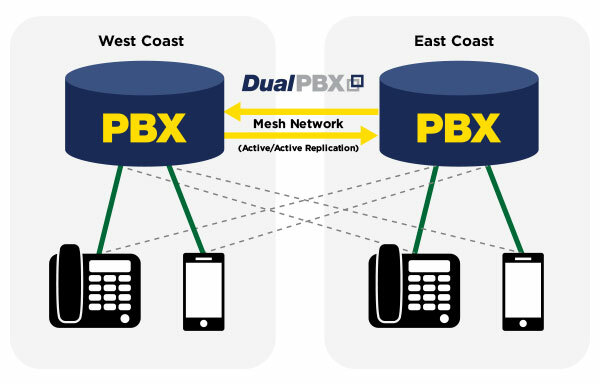 Newly added nodes are added to the DualPBX® mesh and automatically become available to share call processing tasks across all nodes. Where other high-availability schemes require the use of active and standby servers (with the standby servers left idle in readiness for a problem) DualPBX® creates efficiencies by dynamically distributing load across all available servers. Savings are realized because peak hour capacity needs can be shared between nodes, thereby increasing flexibility and reducing the total server requirement across all nodes.